SRM Institute of Science and Technology (formerly known as SRM University) has a lot of career opportunities. Being in Mechanical department the placement opportunities are pretty good too. The campus interaction portal helps us to keep an eye on for all the job offers. The interview process for Schneider Electric was just similar to the training we received. The GD was made easier with the aid of Placement Office and the people representing the company. The personal interview was purely technical testing you on your knowledge for the subject and SRM has made us one already. The overall experience was good and satisfying for an individual with no bias. Smart work than hard work, remains the main motto. 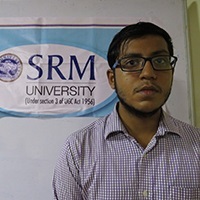 SRM Institute of Science and Technology (formerly known as SRM University) is a place of opportunities and placements are a major part of it. Over 450 companies came for placements covering all departments, hence you get a lot to learn, if not earn. Before appearing for interviews, well training is given to all the aspirants in both aptitude and core subjects. This training is helpful while appearing for companies’ interviews as it is the first step towards a job offer. Moreover, it also helps one for group discussions and further interviews. Hence, it becomes vital to make use of the training offered by the university because it helps one to gain confidence before the main interview. VA Tech WABAG also carried out a three step process including an aptitude test followed by GD and a personal interview. The training gained at the university from the beginning of my engineering helped me to clear the phases of placement procedure and earn this job offer. Keep practicing and enhance your skills as there are no short cuts to hard work. I would like to thank and appreciate each and every person related to the Placement Office and Career Development Centre (CDC) for their efforts, as their initiatives and hard work have given us such an opportunity to take our first step towards a successful career. The help and training provided was unparalleled. The technical training provided by our department and GD, PI and aptitude training provided by CDC helped me boosts my confidence. I would like to thank the placement office for bringing in such renowned, established companies. The placement process as well was handled meticulously. HUL process had us fill two very specific application forms based on which short-listing was done and then there was GD and PI in HUL Chennai office. The training and support provided me confidence to compete against the best from south zone and be placed. It was a great experience as well as learning process through the procedure followed in the placement interview. It made me to find out my strength and weakness, hence whole journey was a tremendous learning process. I would like to thank SRM for putting so much effort on the students and helping us for our betterment. Every process of interview is designed so properly that help us to filter out best in ourselves as well as the people looking for great talent. I think there are so many opportunities for the students which will not be anywhere else. At last, I would like to thank SRM once again for offering and making ourselves proud with so many opportunities. The entire process of placements was entirely pre-planned. There was no confusion which soever. The training given by CEC was really helpful as aptitude and verbal are the most important section in the online test. Our department also gave us training in our core field and it helped us brushing up our technical knowledge. There were many pre-placement activities conducted by our placement cell such as AMCAT test series which was really helpful.